In this year of celebration and examination of all things Scottish, the bicentenary of Walter Scott’s prose debut seemed to fall almost faintly. Far greater tribute was paid to Scott the man and his Waverley ‘brand’ than to the novel of 1814. The only publisher to release a new edition this year (Vintage) did so without any reference to the anniversary. Despite auspicious status as a literary innovation (the first historical novel) Waverley is often thought of simply as a piece of Scottish kitsch, and Scott himself a prolific ‘establishment’ hack. To dismiss Scott as the originator of all things tartan-and-shortbread is something like holding Jane Austen responsible for the rom-com. Admittedly, Waverley’s stately language and fireside narration are certainly not modern, Scott’s characters, even his highlanders, speak in courtly pronouncements, but elsewhere the author delights in his narrative experiment. In his Introductory he fixes us in a precise now, “this present 1st November 1805” (knowing it is not the reader’s present) all the better for sending us back sixty years. Our hero mingles with historical events – the fringes of history are rewritten. The novel’s postscript arrives as a relocated preface, and a beautiful essay in itself. When Anthony Burgess called Alasdair Gray “the best Scottish novelist since Sir Walter Scott” he did so on the strength of Gray’s debut. We can also reverse the comparison and reimagine Waverley as Scott’s Lanark. It is at heart that very ancient tale of the stranger in a strange land, radicalised by adventure. As long as Scotland is still a strange land, Waverley is a radical novel. 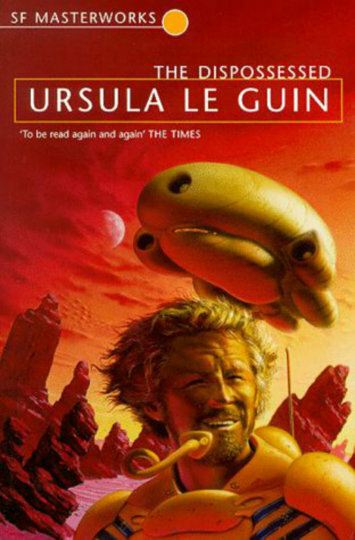 Another print anniversary which slipped by this year was the fortieth birthday of Ursula Le Guin’s The Dispossessed. Le Guin turned 85 in October and received a medal from the USA’s National Book Foundation for her Distinguished Contribution to American Letters. She used her acceptance speech to make an attack on capitalism, to nervous applause. She spoke as a veteran of the margins, science fiction and fantasy, domains which no longer need defending (having triumphed in the Game of Genres). What Le Guin spoke against was the market, and marketing alone is responsible for building the walls between genres. The Dispossessed should strike any reader, not as a masterpiece of science fiction – which it surely is – but as a fluid, poetic novel about humanity, which happens to be set on other human worlds. In a far solar system a habitable moon sustains a revolutionary society, functioning without law or government, set apart from the planet it rejected. From this utopia a physicist travels to the old world, to complete a work for the benefit of all humankind. His encounters with property and violence form half the novel, while the alternating chapters tell the story of his utopian life. The plot is channelled and driven by the enormous ideas of the central character. Shevek’s philosophy of time and space forms the backbone of his adventure: “You can go home again… [his theory asserts] so long as you understand that home is a place where you have never been.” While a world so much like our own is rendered alien, Shevek’s planet appears ever more humane in comparison, all the more possible and desirable. The novel’s title in full is The Dispossessed: An Ambiguous Utopia. The ambiguity persists in our definition: utopia is the home where we have never been. Two years ago Gruff Rhys commissioned the artist Pete Fowler to recreate the likeness of Rhys’s infamous eighteenth-century a ncestor, John Evans. From Fowler’s designs fabric sculptor Louise Evans then built a metre-tall “felt avatar” complete with accessories. Rhys and the reconstructed John Evans travelled to the US on an “Investigative Concert Tour (TM)” (in protest at the commercial determinism of modern touring) – the purpose, to recreate Evans’s journey of the 1790s, which took the young man from his home in Wales to the uncharted “American interior.” Under the influence of Welsh nationalist radicals, Evans had gone in search of a mythical tribe of Welsh-speaking Native Americans who were said to have encountered the Welsh Columbus, Prince Madog. Almost by accident the young Welshman was instrumental in mapping and defining a swathe of the United States. American Interior exists as an album, feature length documentary, mobile app and live musical experience with Powerpoint presentation. Perhaps the endeavour is most experimental in the form of a book. It is a story about nations and nationalism, about cultures, their survival and their fantasies. The narrative is simple, often lyrical and quite absorbing. A convincing analogy is drawn between European proto-nations like Wales and endangered Native American cultures. While Rhys pays tribute to idealism, he does not forgive any form of colonialism. He manages to entertain myth without writing pseudo-history. Perhaps the hero of the story is the exceptional, unsung (and almost of out-of-print) Welsh historian Gwyn A. Williams. Like the Welsh separatists who induced Evans to explore America, it was Williams who inspired Gruff Rhys. So it falls to our artist-adventurers to celebrate our lost historians and our lost histories.